When you are assembling resources for a project, don’t overlook the role of a facilitator. When a group or team needs to make decisions, a facilitator is a great resource to lead the meeting to ensure the goals are met. Before a meeting occurs, the facilitator must meet with the project sponsor and planning team to discuss the goals of the meeting. Then the facilitator will review the room location to ensure it can be set up to maximize participation. 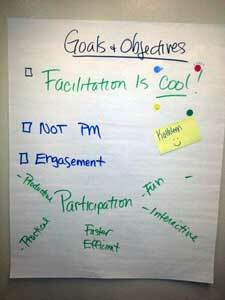 Goals/Objectives – It is critical that the group understand the goals and objectives for the meeting. If there is a series of meetings, there may be overall goals and objectives but each meeting may have more specific goals for each session. Agenda – An agenda helps meeting attendees focus. The agenda should include major milestones and breaks. Start and finish ON TIME! During the introduction of the meeting, make any adjustments suggested by the team. This is step 1 to agreement. Do we ‘agree’ on our agenda? Ground Rules – How will we work together? 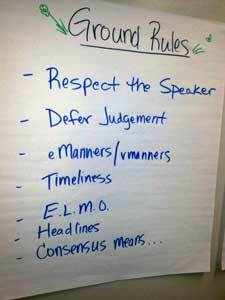 Don’t assume that everyone shares the same ground rules for a meeting. It is critical that the group review the ground rules together and makes any changes. This is another great point for engagement and agreement. 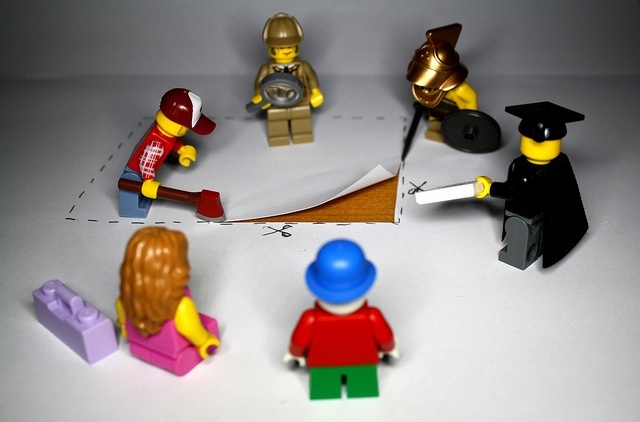 “Do we AGREE on the ground rules?” Ask the team to highlight their favorite ground rule. Parking Lot – How will we manage issues that are not part of the initial goals and objectives? Don’t forget to include a place to note other items that arise as part of the discussion. It is critical that the facilitator revisit the parking lot at regular times to ensure they are addressed. Are you ready for your meeting? Do you plan to walk into the conference room and start the meeting? One of the most important elements of a successful meeting is room setup. Why? If a group needs to have a discussion and a high level of engagement, the room must be set up to support this interaction. The facilitator should be visible by all. Small tables set up in a chevron formation around the facilitator are ideal. This allows attendees to see each other as well as the facilitator, while also moving and interacting. The WORST setup is a classroom style where everyone is facing forward and cannot interact with each other. Before the meeting begins, the facilitator should have the flip charts ready and place sticky notes, markers, and a few fidget toys on each table. If members of the team don’t know each other well, name tents are a must! 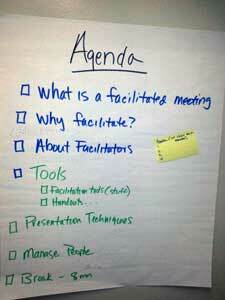 The facilitator should welcome everyone to the meeting and review the 4 magic flip charts. The facilitator must build excitement and describe a successful day. To help immediately engage members of the group, the facilitator should ask people to read part of the objectives and agenda. She should ask the group if there are any necessary changes. Once the group agrees on the objectives and agenda, move on to the ground rules. This is a critical step that allows everyone to discuss how they will work together. Cover e-manners (how will we interact with our phones, tablets, etc.) and v-manners (what about people joining by phone or video). Finally, the facilitator should review the purpose and use of the parking lot and ensure the team understands and agrees with this tool. After establishing a strong base, the meeting is ready to begin.